HONORABLE MENTION: Auburn 6-2, Bethlehem 5-3, Buffalo Timon-St. Jude 6-2, DeWitt Clinton-PSAL 7-1, Corning 7-1, Deer Park 5-2, East Islip 4-3, East Meadow 6-1, Elmira 6-2, William Floyd 4-3, Flushing-PSAL 6-2, Half Hollow Hills West 6-1, Hyde Park Roosevelt 5-2, MacArthur 5-2, Mahopac 5-3, Mepham 5-2, Middletown 5-3, Minisink Valley 7-1, Msgr. 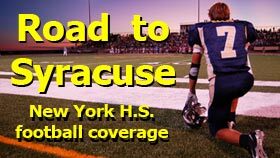 Farrell-CHSFL 6-2, Northport 5-2, North Rockland 5-3, Riverhead 5-2, Rochester McQuaid 5-3, Sachem East 6-1, Scarsdale 6-2, Smithtown East 5-2, Syracuse Corcoran 6-2, St. Anthony-CHSFL 5-3, Tottenville-PSAL 6-2, Warwick Valley 6-2, Webster Thomas 6-2. HONORABLE MENTION: Amstedam 6-2, Bayport-Blue Point 5-2, Beacon 5-3, Bishop Maginn 6-2, Brockport 6-2, Carthage 6-2, William Grady-PSAL 5-2, Hsmburg 6-2, Islip 6-1, Lafayette-PSAL 5-2, James Madison-PSAL 6-2, McKee Tech-PSAL 7-1, Nyack 5-3, Port Jervis 5-3, Roosevelt-L.I. 6-1, F.D. Roosevelt-PSAL 6-2, Scotia-Glenville 6-2, Sewanhaka 5-2, Sleepy Hollow 6-2, Westhampton 5-2, Williamsville South 6-2.